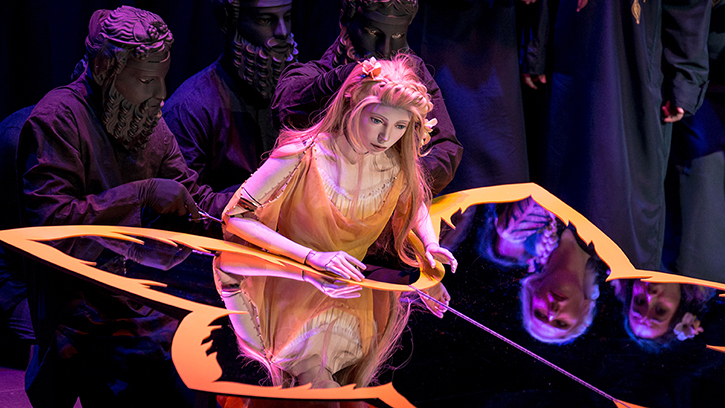 Through puppetry and mesmerizing stage design, Michael Curry vividly animates Stravinsky’s Persephone in a new production coming to the Seattle Symphony this April. When the Seattle Symphony presents Stravinsky’s Persephone on April 26 and 28, the orchestra and chorale will be joined by some larger-than-life characters — puppets created by esteemed director and designer Michael Curry. Produced in his studio outside Portland, Oregon, Curry’s work has been seen around the world in productions for Disney, Cirque du Soleil, the Olympics and even the Super Bowl. Yet, until last year, he had not had a performance in the Northwest for more than 15 years. "Persephone was the ultimate puppet because she was so manipulated by the Gods. But one thing we decided is that we wanted to empower Persephone in our version. She wasn’t going to be a victim." Persephone is a retelling of an ancient Greek myth about sacrifice and renewal. The legend begins when Hades, god of the underworld, kidnaps Persephone, the daughter of Demeter, goddess of the harvest. Hades imprisons Persephone in the underworld, leaving Earth frozen in perpetual winter. In classical mythology, the abduction of Persephone and her subsequent rescue explain the rotation of winter and spring. But in Stravinsky’s version, with a libretto by André Gide, Persephone descends to the underworld as an act of compassion after she gazes into a narcissus flower and sees the trapped souls. Eventually, a deal is struck between Hades and Zeuss, ruler of the Greek gods, and Persephone agrees to spend a third of the year in the underworld, bringing winter to the world above. Curry’s production interchanges puppets and humans in a way that plays with the illusion of two worlds. Persephone, for example, is played by both a dancer and a puppet. To play up the duality of the character, Curry built the puppet to be an exact likeness of the dancer, who in turns wears a mask of the puppet’s face. “I guess it’s a backward compliment, but many people told me that they didn’t realize there was a puppet Persephone when we did the production in Oregon,” he laughs. To deepen our experience with Stravinsky, Morlot has programmed a full evening of his music, including the Concerto for Piano and Wind Instruments with pianist Marc-André Hamelin and Les Noces. Throughout his life, Stravinsky turned to Russian folk music for inspiration and, in Les Noces, he sets lyrics from traditional Russian wedding songs. To highlight these early Russian influences, Morlot as has invited the historic Dmitry Pokrovsky Ensemble to perform the original four piano and percussion version of Les Noces. Founded in 1973, the Dmitry Pokrovsky Ensemble was the first group of professional musicians devoted to the performance and preservation of traditional Russian music. The musicians have traveled the length and breadth of Russia, documenting and performing these rapidly disappearing traditions. Star soloists, dancers, puppeteers, three choirs, four grand pianos — don’t miss a spectacular evening of music at Stravinsky’s Persephone on April 26 and 28! Marc-André Hamelin’s performances are generously underwritten by Muriel Van Housen and Tom McQuaid. Support for Stravinsky’s Persephone is generously provided by the Judith Fong Music Director’s Fund.